Over the last 3 years our holding company FP&A Solutions has been running two separate brands for business intelligence and planning: “Clear Jelly” and “Agility Planning”. To simplify operations and make it easier for users to use both solutions, we have decided to integrate the two platforms into the new “Acterys” solution. With Acterys users will benefit from the features of both platforms as an integrated solution for planning and analytics. The previous “Clear Jelly” functionality will from April 18th be available as the “Acterys Connectors” for different accounting systems (Xero, Saasu, QuickBooks). The Acterys Connectors allow users and accounting professionals to generate a professional analytics platform (“data warehouse”) that enables interactive analysis, dashboards and flexible reporting for unlimited entities (consolidation) in cloud based accounting systems and other data sources. In addition to that, Acterys Connector users will have the option to upgrade to Acterys Premium previously “Agility Planning” a professional platform for financial planning & analytics (FP&A). 1. The option to extend and modify Acterys Connector or other data models. For example adding scenarios, simulating new product introductions, acquisitions etc. 5. Effective Collaboration directly integrated to your office tools like Excel, Power BI, Outlook, Microsoft Teams, etc. How will the transition take place for Clear Jelly users? How will the transition take place for Agility Planning users? >Apart from some great new features that will be announced soon, everything will stay as is but using the new Acterys branding. >No, but the current pricing model $49 USD per entity and month will be applied to all users once their contract period has expired. What’s the price for upgrading to Acterys Premium for Clear Jelly user? 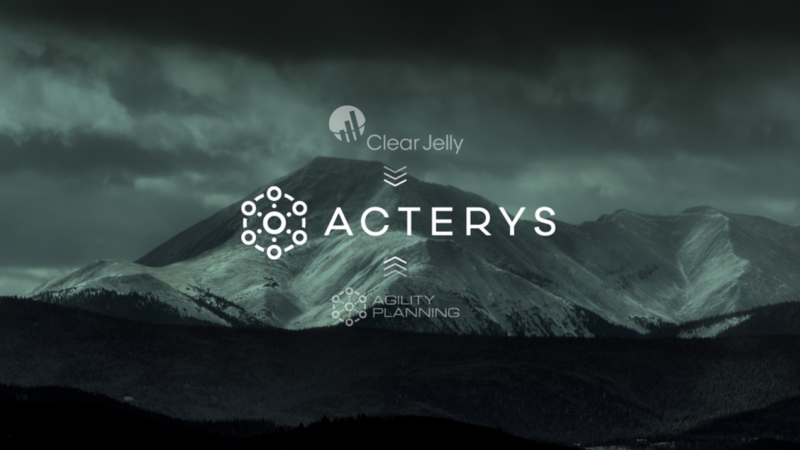 >Acterys Connector users (formerly Clear Jelly) will get a 2 weeks free trial of all Acterys features. After that they have the option to upgrade their Acterys Connector subscription to an “Acterys Admin” user with all Acterys features for an additional $40 (USD) per month. Additional users can be licensed as per the current Acterys price list. Please don’t hesitate to contact our Chat Team on the site for any further questions.